Dr. Zavala is the PI of the CSUN MARC U*STAR (T34GM08395), RISE (GM063787) and ASCB IPERT (GM116707). She is also an associate director of the NRMN Mentorship and Networking Core, a past president of SACNAS (2002-2003) and a recipient of the Presidential Award for Excellence in Science, Mathematics and Engineering Mentoring from President Clinton in 2000. 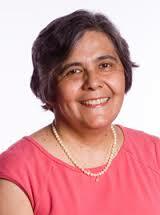 She is the first Latina to be named a Fellow of the American Society of Plant Biologists. Join us in congratulating Dr. Zavala!